Krystalyn holds several RYT 200hr yoga certifications and two life coaching certifications based on sattvic and esoteric principles. She has trained in postural alignment, yoga therapeutics and internal martial arts. She continues to broaden her coaching practice in money and sacred sexuality. 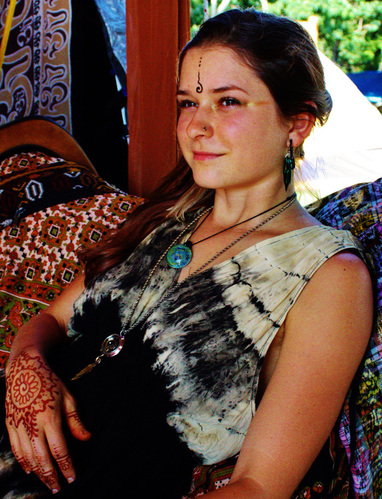 Krystalyn is a master henna artist having adorned thousands of bodies with her magical touch. She manifests her esoteric creativity through a blend of sacred geometry, traditional Indian design, and organic foundations. She maintains a thriving henna and up-cycled art business with thousands of aesthetic pieces shared internationally. Krystalyn journeys with you to uncover the great perfection of your own true nature. Engaging in empathetic listening and powerful open ended questions as she facilitates, Krystalyn creates a safe space for greater self reflective clarity. Experience the freedom and empowering truth as your inner wisdom harmoniously unfolds. Take your power, peace of mind is the only true medicine!